We purchased this FANMATS NHL Chicago Blackhawks Chrome Hitch Cover as a gift. It arrived in a small box tightly wrapped in bubble wrap. The hitch was labeled with an official NHL emblem logo sticker that easily peels off. The hitch weighs about 5 pounds. You can clearly see and feel the durable chrome body. The hitch arrived in mint condition, free of scratches and dings. The hitch does not come with a hitch pin and clip to secure the cover onto a hitch. A pin can run between $3 and $10 on Amazon. There is CURT 21510 Coated Hitch Pin and Clip that locks to a hitch to prevent burglary of your cover hitch. I’ve had the Chicago Blackhawks chrome hitch cover for about a year now. I am local to the Chicago area and we have harsh summers and winters with rain and snow so often. In the first few months, the cover hitch performed well and maintained it’s chrome finish. I never removed the hitch cover from the vehicle for anything and I don’t really use my trailer hitch that much. In about 6 months, the hitch began to rust around where the pin engages it. By the end of the year, the cover hitch started getting rusts spots on it too. If properly maintained, the rust is easily removed with white tooth paste (arm and hammer toothpastes works best) and makes the hitch cover look like new. I find myself needing to remove rust in that it disrupts the covers appearance every 6 or so months. It takes a few minutes while I’m washing my car. I am overall pleased with this hitch cover. 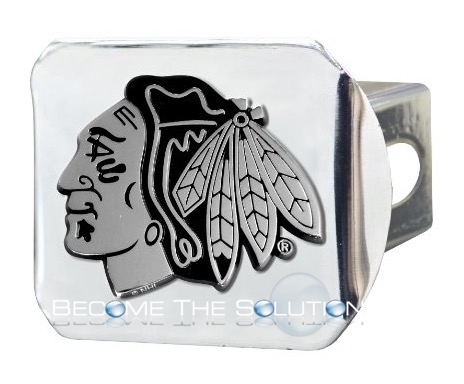 It’s durable, extremely appealing, and popular with Chicago Blackhawks fans. I would buy another cover to put on my other car if desired.